Walking, Hiking, and Scrambling route descriptions and reports, mainly focusing on Snowdonia and the Peak District, eg. the Snowdon Horseshoe, Tryfan, the Bochlwyd Horseshoe, and Kinder Scout. GPX files provided for all routes. 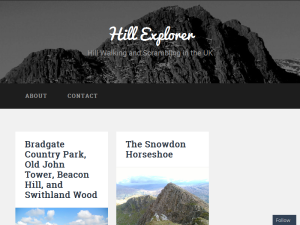 This what your Hill Explorer - UK Hiking Routes Blog Ad will look like to visitors! Of course you will want to use keywords and ad targeting to get the most out of your ad campaign! So purchase an ad space today before there all gone! Q1: What inspired you to write Outdoor Adventures with Children? Carl: Obviously having two kids ourselves was a key factor. To be honest, we were really surprised that there was not an equivalent to this book. It was a bit like when we wrote Europe’s High Points: Reaching the summit of Every Country in Europe, we wanted to buy a guide book that did not yet exist so we thought we better write it! Rachel has been particularly driven by the societal value of this book, you know, her desire to change the world for the better – this one is definitely her brainchild. Rachel: Well I kept hearing news reports about ‘nature deficit disorder‘ and how kids these days are glued to screens and supposedly getting fatter and lazier; getting outside less and having more mental health problems. I’m also a primary school teacher and I’ve worked in both inner city and rural schools. So I believe it has given me some perspective. I’m a big fan of getting children outside and having adventures, getting fit and playing in the great outdoors because I’ve seen first-hand how much children and parents get out of it. This book hopefully will inspire parents and children, but importantly it really facilitates family adventures by giving parents all the information they need to go out and do something inspirational with their kids. I am proud of this book because parents will know that these routes are clear, reliable and have been tried and tested by real families. Above all they have been given the thumbs up by the harshest of critics – the under twelves! Getting outdoors is not always an easy sell is it? Q2: What would you say to any parents out there who want to get their kids into the outdoors, but can’t get them off their iPads? Rachel: There are ways. My instinct is to say – and I’m going to sound like an unfashionably strict teacher here – take the Ipads off them and remind them that you’re in charge; don’t give them a choice about whether they want to go out or not and they’ll quickly discover you were right all along and the outdoors is a whole lot more fun than Minecraft! Obviously, sometimes that is easier said than done. To be honest though, technology does not have to be the enemy; it can also be your road to success. I know some parents who were keen to get their children to go on hikes and so on, but were finding it an uphill struggle until they discovered geocaching. Geocaching is essentially treasure hunting for kids. You use a free smartphone app that functions on a GPS system and usually has clues. With phone in hand you go on a hike tracking down hidden treasure (well, Tupperware boxes filled with tiny ‘swapsy’ trinkets!). It sounds ridiculous, but it really works to get techy kids enjoying the outdoors. For younger kids, rebranding a ‘boring’ walk as an ‘adventure’ or ‘going exploring’ works really well. Failing that, there’s just good old fashioned bribery! Carl: Yeah, I used to be a secondary school teacher. I lost count of the amount of times kids thanked you afterwards for getting them to do something they thought they didn’t want to do. Sure, it can be hard for them to try something unfamiliar, but then are we as adults any different? If children climb a mountain or complete a bike ride, you can be certain that even if they found it difficult at the time they’ll be really proud of it afterwards and will want to tell their friends all about it. Q3: What adventures do you remember having in your own childhood? Rachel: My parents were quite outdoorsy. When my mum was eight months pregnant with me she had to help my dad down Scafell because he’d twisted his ankle. So it’s in the blood really. I went to the Lake District a lot as a child and remember doing some of the adventures in this book myself. I particularly enjoyed taking a blow-up rubber dinghy out on some of the lakes. Thankfully there are still a lot of the lakes which allow public access for swimming and boating – it’s all in the book! Carl: It’s funny, I had traditional working class parents from inner city backgrounds and I used to think I had grown up without really accessing the world of outdoor pursuits. Looking back now I realise the opposite was true. We used to go out and play on the local gritstone outcrops in Yorkshire – Almscliff, Ilkley Moor, places like that. And while I thought we were just mucking about playing hide and seek or soldiers or whatever, it was all scrambling and even rock climbing without ropes – we just didn’t know it. Even today I laugh at my parents’ attitude to risk: some of the stuff we used to blithely clamber up I now know are graded rock climbs – in retrospect, it was total madness! I was in cubs and scouts; at that time they did crazy outdoors stuff that would turn a health and safety inspector ghost-white. Most of all I remember a week-long school trip to the Lake District where ours was the only class that had army instructors. Those nutters let me do forward abseiling: it was fun, terrifying fun – but that was total madness too! Q4: Who is the book aimed at? Rachel: Primarily the book is aimed at outdoorsy parents who want the best ideas about routes that will work to keep the whole family entertained. It’s for people who want to do a range of outdoors activities like camping, scrambling, going to caves, kayaking and biking. That said, this book will also work for parents who might not be sure they are outdoorsy – it’s for the converted and the yet to be converted! Q5: How did you decide which routes to put in? Rachel: Not too tricky, we know the Lakes really well. We also did a lot of consulting other parents and asking about their experiences and what things they’re kids had enjoyed in particular. We were keen to ensure a wide range of activities and to make sure the majority of routes had options for families with younger and older children. In the end we have a mix of classics and off-the-beaten-track places. We kept the routes within the grasp of under-12s. At the harder end you’ve got routes that we tested with your sons, like the Corridor Route on Scafell Pike. We also tested out Jack’s Rake on Pavey Ark with them because we knew they were strong scramblers with good mountain instincts. While Jack’s Rake was a potential route for older kids, it was deemed in the end just that bit too hairy to recommend in this book, even for older fairly experienced kids. Q6: How does the grading system work? Rachel: We went with a ‘ski run’ system. Green routes are for everyone, blues for those wanting a bit more challenge. The idea is that you build experience on the greens and blues before tackling the red and black routes. Most of the harder routes have easier options too. That said, a green or blue route is not just for beginners, it will be enjoyed at any age. Q7: Will there be similar books following for other areas? Carl: We’re hoping so. 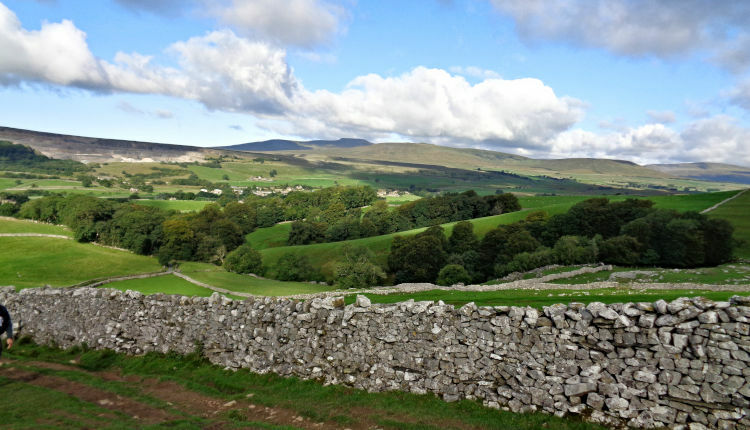 As we live on the border of the Yorkshire Dales National Park that’s the next logical area. Then the Hillexplorer site is a mine of useful information about the Peak District and of course, we’re always keen to get back to Wales, where we worked on Scrambles in Snowdonia… they’re in the pipeline! 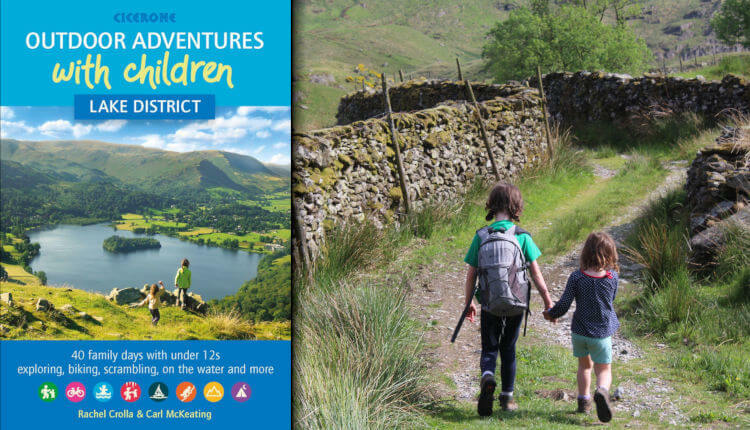 ‘Outdoor Adventures with Children – Lake District’ was published on the 11th April 2019, and will be available directly from Cicerone Press themselves, or alternatively from any number of other book retailers. The day before this walk, I completed the Fairfield Horseshoe in glorious weather. That night, as darkness fell and I sat in my car preparing to snooze, the thick fog rolled in. It was no surprise, the weather forecast that I’d been regularly checking had predicted as much, and the fog was here to stay all day. One thing was for sure – there would be no outstanding views on this walk. The walk started at the Old Dungeon Ghyll car park, a normally popular starting point for walks around the Langdale Pikes. It clearly wasn’t so popular on this morning as the car park was empty bar 2 cars, and I certainly wasn’t complaining about that as I love a quiet walk. From the car park, I headed south along an unnamed country lane that eventually led uphill towards Blea Tarn. After a short spell of walking, the lane briefly followed the line of Redacre Gill which signalled to me that my turning point was coming up soon. A footpath veered off on the right, following the line of Redacre Gill upwards towards its source. The footpath initially starts to the left of the gill before eventually crossing over to its right. I’ll be honest, this part of the walk was a real slog and it seemed to take a lifetime of walking and wheezing before the top was reached. To make matters worse, there’s at least 2 false summits on the way that do the usual job of dashing your hopes. And of course, there’s always at least one show-off fellrunner that overtakes you whilst you huff and puff, doing their best to make you look physically unfit to be on the hills. Visibility wasn’t too bad at the moment. It wasn’t good enough to see any surrounding mountains but good enough to see a decent distance in front and behind. And more importantly, it was dry. Eventually, the final slope to the summit of the Pike of Blisco was in sight. This section added a bit of interest to the route as the path became a series of easy mini-scrambles. The top was reached quickly and I soaked up the amazing views all around me of grey mist. The route now headed initially south downhill before eventually turning to more of a westerly direction. The next stop was Cold Pike and it was just about visible through the mist as I made my way down the slope towards Red Tarn. The valley floor made a good place to stop for a breather before the next ascent. The path continues on the opposite side of the valley but doesn’t ascend directly to Cold Pike. It instead passes it on its northern side. A detour needed to be made in order to bag the summit of Cold Pike but I unfortunately became a little disorientated in the mist and missed my turning off spot by some distance. This section unfortunately added a lot more time to my journey than I was intending. The map at the bottom shows my intended route. I was actually almost at Crinkle Crags before realising my error and backtracking. Eventually the summit of Cold Pike was reached, and again I was treated to occasional glimpses of nearby mountain tops through the mist. I imagine that the view from here would have been amazing on a clear day. I apologise for all these photos looking a bit bland and similar. There really wasn’t much to capture apart from rock with a backdrop of mist. From Cold Pike, I headed back to Crinkle Crags and made my way up to the top of the first crinkle – named South Top. All of a sudden, the mist parted and I had a lovely clear view of the second crinkle ahead of me. I thought for a second that the mist was going to continue to disperse leaving the rest of the route clear. I was wrong. The view lasted for about 30 seconds before the mist came back in, thicker than ever. Visibility was now very poor and to make matters worse, the drizzle started. I made my way down from South Top to the supposed highlight of the route – the bad step! This is a small simple scramble that can be avoided by skirting around and following the path to the left. The bad step itself is navigated easily by climbing the wall on the right. Once up then it’s a brief walk to summit the second crinkle – Long Top. I’d love to describe the rest of Crinkle Crags but unfortunately I could barely see a thing from this point on in the mist and drizzle. I lost my way a little bit on Long Top and ended up wandering west instead of north before realising my mistake. The plan from here on was to simply climb anything that looked high and hope that they included all the official summits on the crags. I’m confident I did that so I’m claiming them. I continued following the route north, gradually downhill over rocky terrain, until I arrived at the area on the map labelled ‘Three Tarns’. The original plan was to continue on to Bowfell and then Rossett Pike but daylight hours were running out fast. I decided to cut the walk short. I devised this as a walk to take my 4 year old son, Harry, on. He doesn’t quite have the legs yet for a long hike but likes to feel that he’s climbed a mountain. 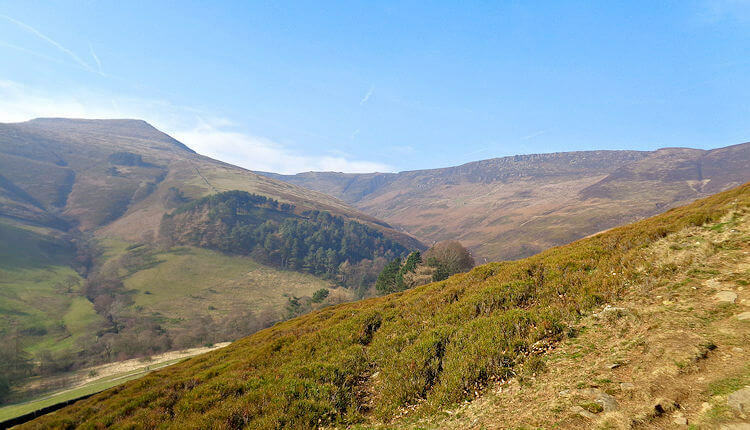 The route to Ringing Roger is the shortest and most direct option available from Edale. After parking in the main car park at Edale (where we literally took the last available space), we headed off up the road before taking the Grindsbrook path on the right. After crossing Grinds Brook, we emerged onto open pasture land. The path to Grindsbrook Clough continues north, following the line of the brook, and the path that forks off on the right uphill is the path that ascends The Nab up to Ringing Roger. Naturally we took this path and headed on up. It was slow going as his little legs worked hard to power him up the hillside but eventually we arrived at the foot of the gritstone outcrop known as Ringing Roger. It’s possible to bypass this and continue along the path but, to a small child, clambering on rocks is the highlight of any walk. I carefully guided him up a few of the trickier sections and tried to give him a real sense of climbing up a mountain. After reaching the top, we took a short break and he fuelled up on Fruit Shoot and jam sandwiches. The original plan was to attempt to walk around the edges and return down at Grindslow Knoll, however we’d spent so long playing on the gritstone that I was worried it would be dark before we finished. Instead, I decided to return back down via the under-used path in Golden Clough. It’s a lovely tranquil path and I don’t think I’ve ever encountered another person on it. Even on a sunny Sunday like today, there was nobody in sight. The track higher up is rather loose with some larger steps down. No problem for my legs but I had to keep a hold of Harry’s hand the whole way down as he frequently slipped and stumbled on the path. He enjoyed the many little waterfall features near the bottom though. Eventually, we arrived at the bottom of the clough which meets up with Grinds Brook. From there, we walked back along the well-used path and back to Edale. This walk was a bit of a last minute decision. The weather forecast told me that Wednesday would be the last day of the freakish February mini summer we were having, and I really hadn’t made the most of it in terms of getting outside. I booked a couple of days off work and decided to head up to the Lake District for a bit of Wainwright bagging. As I’ve said in my previous Lake District posts, the walks I’m following are from the excellent ‘Walking the Wainwrights’ book by Stuart Marshall. He has devised just 36 walks that cover the whole of the 214 Wainwrights without any having to be repeated. I parked in the Pelter Bridge car park, normally £7 a day, and my luck was in. The ticket machine was broken! I took it as a sign that today was going to be a very good day. The sky was already a gorgeous shade of blue when I began walking. I headed north up the lane past the beautiful St Marys Church, and past Rydal Hall and Rydal Lodge. The first footpath that you come to on the left is called the coffin route as it was historically the route used to take the dead of Rydal to the church in Grasmere for burial. The footpath that I needed was the next one on the left after this, which headed up into the hills towards the first Wainwright of the day. I always find the first ascent of the day the hardest and this was no exception. It was one of those routes that are made up of never-ending rocky steps and is a common theme here in the Lake District. I wheezed my way upwards and onwards towards the first Wainwright of Nab Scar and the beginning of the Fairfield Horseshoe proper. The views looking back over Rydal and towards Grasmere were fantastic but unfortunately, I was having problems taking photographs in that direction due to the low winter sun. From Nab Scar, I continued north along the horseshoe, ascending not too steeply past Lord Crag, and it wasn’t long before I’d reached the second summit of the day in Heron Pike, standing at a fairly modest 612 metres. The next target needed a bit of a diversion. Stone Arthur sat north-west of my position on Heron Pike, and the valley of Greenhead Gill separated us. Rather than walking all the way around the valley then retracing my steps (I don’t like retracing steps), I descended gradually diagonally down the slope towards Greenhead Gill, eventually meeting it at a perfect height so that I could easily contour around on the other side towards Stone Arthur. Though Stone Arthur is a Wainwright, it doesn’t really feel like a hill – more of a viewpoint. It’s actually the lowest part of a craggy ridge before it steeply descends towards Grasmere. It was this ridge that I headed along next, slowly ascending towards Great Rigg, the fourth Wainwright of the day standing at 766 metres. To the left, across the valley that houses Tongue Gill, lies the great lump of Seat Sandal. Ahead is the highlight of the walk – Fairfield. I was starting to struggle a little with the relentless sunshine. It was amazing to think it was just February. I’d been wearing just a base layer for the walk so far, and I still felt too hot. The summit of Fairfield, which stands at 873 metres, was rather less craggy than the other Wainwrights on this walk. It had a large flat plateau similar to being up on the top of Helvellyn. In his book, ‘Pictorial Guide to the Lakeland Fells’, Alfred Wainwright wrote about Fairfield “From the south it appears as a great horseshoe of grassy slopes below a consistently high skyline…but lacking those dramatic qualities that appeal most to the lover of hills. But on the north side the Fairfield range is magnificent: here are dark precipices, long fans of scree…desolate combes and deep valleys”. Before continuing around the horseshoe, I made a short journey to the north of the summit plateau so I could enjoy the great views across to Dollywagon Pike and the Helvellyn range. It was clear that, up until now, I’d been shielded from the harsher elements. Once I hit the summit of Fairfield, I was greeted by a cold bitter wind and it felt like I’d just stepped from summer into winter. It was actually quite refreshing because I had been feeling far too warm and so, rather than layer up, I continued in my base layer, relishing the chill. 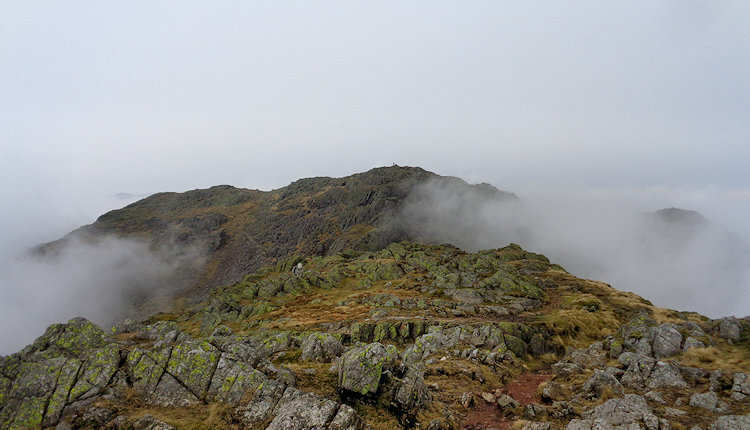 I carried on along the route to the east, enjoying a brief section of easy walking before a steep drop down to Link Hause followed by the immediate ascent up onto the next Wainwright of the day, Hart Crag – standing at 822 metres. The walking from here is straight forward. During the descent of Hart Crag, a wall is met. This wall is followed along the whole rest of the ridge, all the way back to the bottom. After Hart Crag, there’s Dove Crag (unspectacular from this approach), High Pike, and Low Pike before the day’s collection of Wainwright’s is complete. That makes 9 in total. Not bad for a single outing. 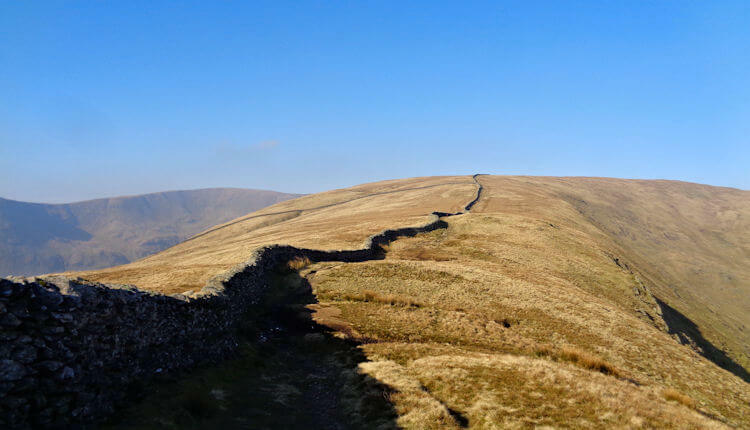 This may sound like a more tedious section of the walk but the terrain is actually quite varied as the wall manages to find a way through a variety of craggy features. Eventually, an easy path branches away from the wall on its eastern side around the area of High Brock Crags. I personally recommend not taking this path and instead continue following the line of the wall for a more interesting walk. There is a touch of scrambling required though just past this point as a craggy section needs to be down-climbed, so be careful. At the bottom of the slope, just before I arrived at Low Sweden Bridge that crosses Scandale Beck, I took a footpath on the right across pastureland, following the line of the beck. This eventually brought me out onto the Rydal Park path, which I followed north (turn right). It’s a nice easy finish to the walk on a pleasant path which passes Rydal Hall. If you have enough energy left in your legs, you could take this opportunity to visit the ‘Quiet Gardens’ in the grounds of the hall. The route also passes a beautiful waterfall and ‘The Grot’, which claims to be Britains earliest known purpose-built viewing station. Eventually, you emerge on the road back where you started near St Mary’s church. I enjoyed a nice plate of gammon and veg at the wonderful Badger Bar in Rydal before returning to the car (aka my bed for the night). I’d had a great day and the weather had been unbelievably good. I had another walk planned for the next day but I knew I wasn’t going to be quite so lucky this time with the weather. The Met Office app on my phone informed me I was to spend the day walking in drizzle and fog. Oh well… variety is the spice of life! The walk starts by Llyn Ogwen, at any free parking space that you can find. There are quite a few parking areas on the stretch of road between Ogwen Cottage and Tryfan. Head west to the end of Llyn Ogwen. As soon as the bridge is crossed at Pont Pen y Benglog, cross the style on the right and begin following the track up the south-west ridge of Pen yr Ole Wen. This is what you call a proper mountain track. No defined paths, arduous, small sections of scrambling, and small sections of steep scree. It’s a completely different kettle of fish from something like the Llanberis path. It’s also a path that you don’t want to be descending at the end of a long walk — not if you value your knees. Eventually, after much slogging uphill, the summit plateau is reached. Looking back across Ogwen Valley at any point during the ascent rewards you with some astounding views of the mountains opposite, from Tryfan on the left, across the Glyders and Y Garn, and ending with Mynydd Perfedd and Carnedd y Filiast on the right. Some decent scrambling over there! 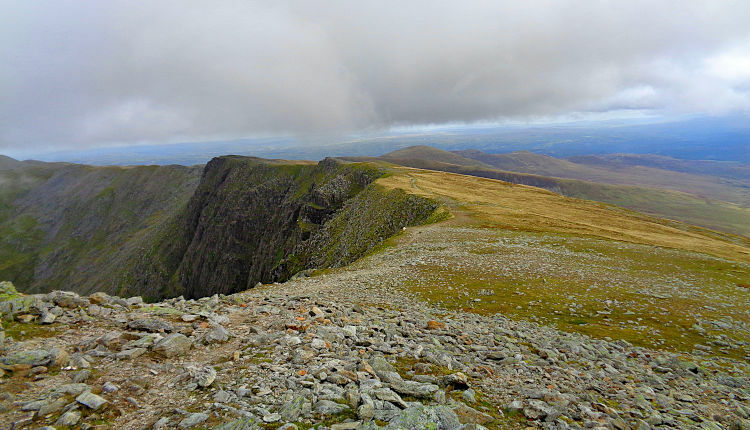 Once on the summit, head north across Bwlch yr Ole Wen, then follow the edge around to the north-west past the large cairn at Carnedd Fach, and eventually to the second summit of the day at Carnedd Dafydd. Approaching from this side, it barely even looks like a mountain. More like a slightly elevated part of the ridge. The impressive features of this mountain aren’t visible until later when, looking back, its impressive north face comes into view. The area down to the right is Cwm Lloer and houses the lake of Ffynnon Lloer. The route continues east along the top of the Ysgolion Duon (Black Ladders) cliffs and offers great views looking north-west into Cwm Llafar. On this section, I made my first sighting of the Carneddau wild ponies down on the slope to my right. I kept my distance as I have an irrational fear of anything that’s bigger than me! The route eventually curves around to the north-east as it passes Bwlch Cyfryw-drum, and the drops to the left become less dramatic. A zig-zagging ascent path to Carnedd Llewelyn is clear to see and this is the one that should be taken all the way to the summit. From the summit, head east then south-east as the route descends Penywaun-wen and towards Pen yr Helgi Du. As the ridge narrows, the impressive Craig Yr Ysfa Amphitheatre can be seen down below on the left. Down on the right is the Ffynnon Llugwy reservoir, and ahead is the narrow ridge of Bwlch Eryl Farchog that leads across to the final summit of Pen yr Helgi Du. It’s a fantastic viewpoint and a great place to stop for a brief rest and properly absorb the atmosphere. To get down onto the ridge involves a short scramble and downclimb. In good weather, it’s a fairly simple affair — but in icy conditions, it can be treacherous and has been the scene of a few accidents in the winter months. After navigating the scramble, the ridge is crossed south-east and Pen yr Helgi Du is ascended directly and steeply. Legs and knees are probably feeling a little weary at this point, but luckily the descent route from the summit of Pen yr Helgi Du is possibly the easiest and gentlest descent route in Snowdonia. It’s a very easily angled, grassy slope that heads south all the way back to the A5 where a bit of road walking is in order to get back to the car. For the past couple of years, I’ve been suggesting to my kids that they might fancy giving the Yorkshire 3 Peaks challenge a go. Up until this year, they half-heartedly gave it some consideration… and finally decided that this year was the year. Well, almost anyway… my eldest son Sam, who was 13 at the time, decided that he’d really like to do it. His younger brother was unfortunately too far lost in the fantasy world of Fortnite. A whole day away from that was a possibility far too terrible to even think about. So me and Sam set about doing it. I’d done it 3 times already and so gave him a rough idea of what to expect. I also warned him that we were only going to do this if he was really serious about it. I don’t like failing a challenge, and if he was going to attempt it with me then he’d be expected to walk until no longer capable of walking. And no whining either about being hungry, thirsty, aching legs, etc. I gave him my little collection of rules and tips: Take it easy on the ascents and up the pace on descents and flat ground. Conserve your fluids… don’t drink them so quick that you run out halfway through the walk. Don’t stop too regularly for rests… it really doesn’t help that much. If your legs and feet hurt, ignore them and carry on… they’re supposed to hurt. That’s why it’s a challenge. And do not, under any circumstances, let inferior looking people overtake you. Each time it happens, a little bit more of me dies. If someone overtakes me, I want it to be a fell runner or a seasoned hiker with huge calf muscles. I can live with that. We set off early in the morning and arrived about half 8. It was reasonably busy, but considering it was still the summer holidays, it wasn’t quite as busy as I was expecting and there were still plenty of available parking spaces. We completely ignored my advice and stormed up Pen-y-ghent at speed, overtaking many unseasoned walkers, and maybe a few seasoned ones too on the way. Before we knew it, we’d hit the summit. The last time I did the challenge, visibility was poor on top of Pen-y-ghent. The time before that was in the dark, so it was nice to finally see the great views again from the top. I warned Sam against feeling too optimistic… it’s common to feel that after gaining the first summit so quickly and so I informed him that it would be a long time before we got anywhere near the second one. I persuaded him against having a break so early and so we quickly took the summit photos and continued on our way. And just as I said, this section was a long stretch. By the time we arrived at the Ribblehead Viaduct, Sams legs and feet were truly tired. We hadn’t stopped yet as I wanted to push on until we got to the food stall near the viaduct. Most people take a break at this point and so we did too. I bought a cup of wishy-washy tea and a disappointing hot-dog. Sam bought a cheeseburger which looked utterly amazing; Loads of cheese, very meaty, and dripping with grease. I was envious but tried not to show it. After feeling refuelled, we continued up the long path to Whernside. It had turned into quite a decent day with the sun coming out every so often. After the stroll across the plateau and a quick visit to the trig pillar, we descended down the steep loose path. At this point, I was actually in worse condition than Sam as his knees were a lot more resilient than mine and contained much more cartilage! Despite this, I certainly wasn’t the one complaining. ‘Shhh’, I said. ‘Can you hear something?… it sounds like… a child whining’. ‘I’m not whining’, he said. ‘I’m just saying’. We headed towards the farm that has a nice little cafe set up in one of the buildings. I promised him we’d have our second stop when we got there. ‘It’s just at the bottom of the hill’, I said. It was a little further away than I thought. After a few repetitions of ‘It’s just round this next bend’, and maybe one instance of ‘You see that building over there? well, that’s not it’, we eventually arrived at the cafe and fuelled up again with junk food and drinks. After leaving the cafe, we soon arrived at the road. Sam looked totally fed up and so I asked him if he wanted to quit or continue. ‘I want to quit’, he said. ‘OK’, I said. ‘That’s fine but there’s something you should know first. If we walk back to the car from here, we’ll have to completely circle Ingleborough. We would actually cover more mileage than if we just went straight over the top’. Realisation set in followed shortly by a look of resignation. ‘OK’, he said. ‘I’ll do the last one’. So we headed up. It doesn’t actually take long to get up to the summit from the road and it’s quite a pleasant walk most of the way. There’s just one hideously steep bit at the end. The final push. We arrived at the final summit and took photos of the final trig. It wasn’t over yet though. The descent back to Horton is longer and involves at least another good hour of walking. Both our legs were shot at this point and we were walking with stiff bowed legs as if we’d been riding a horse for the last 12 hours. It may have also looked as though we’d both had little accidents too. Sam was wanting frequent rests every ten minutes now but I wasn’t having any of it. I just wanted to get back to Horton as soon as possible as there wasn’t much daylight left. I informed him that there was no point resting as all it was going to do was allow his legs to seize up, and it would still be painful the second he started walking again. The best thing to do was to keep plodding on. Just grit your teeth and shut up. I noticed to my horror that cows were grazing all around me and my anxiety levels shot up. It’s the first time I’ve seen them on the way down from Ingleborough. I soon realised that there was nothing to be scared of as they were spread very thinly over a large area – and not all getting together and ganging up on me like they normally do. After a while, we decided to try jogging a little (not because of the cows). Strangely, our legs didn’t hurt anywhere near as much when we did this. Or maybe not strange as different muscles are utilised for running than walking. We were resting the fatigued muscles and utilising others. That’s how I explained it anyway… it sounds right. It may also be a load of crap. Signpost to Horton, 1 mile to go! Eventually, at long last, we arrived at the railway line in Horton. I pointed out other walkers that were also clearly in pain for the benefit of Sam, just so he could see that it’s a perfectly normal experience on a challenge walk. I can’t remember his exact time but it was between 11 hours and 12 hours. It was a good walk and Sam had done extremely well – I was proud of him. I’ve told him that next year we’re going to try something even more adventurous. I’m sure he’s completely looking forward to that. If you are the owner of Hill Explorer - UK Hiking Routes, or someone who enjoys this blog why not upgrade it to a Featured Listing or Permanent Listing?